I first visited Venice many years ago with my Valentine. We were young and naive about what love was all about and spent hours hopelessly gazing into each others eyes over Prosecco on St Mark's Square, asking random strangers to take pictures of us together. In the text book of romance, Venice is in the first paragraph Chapter One along with Tiffany turquoise boxes and Interflora deliveries. Even the suavest man of them all, James Bond gave into the cliche and took the first love of his life, Vespa to Venice before she met with a watery end in Casino Royale - what more of a rubber stamp do you need? Venice equals romance, even the guide book says so. To me, true Venice is like true love. It's not about the grand gestures and the over-priced Gondola ride. It's about discovering the magic of this city that can be experienced at any time of the year, like when you realise that every day is Valentines Day when you discover true love. Venice is best enjoyed by those who want to explore all that this wonderful city has to offer and by those who want to photograph more than just themselves on a camera phone from an arm's length! My top tip, don't go in February but don't leave it too long as the city is currently sinking at a rate of 4mm a year. 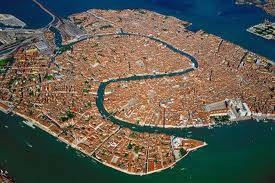 I have two favourite hotels in Venice, both are within easy each of St Mark's Square. The Danieli dates back to the 14th century when it was the residence of a noble Venetian family, The Dandolos. The hotel is located on the water's edge overlooking the lagoon and is easily reached by water taxi. The interior of the hotel is utterly beautiful with luxurious red and gold velvet, marble pillars, and frescos. This is the sort of hotel where it is possible to feel a little underdressed when you're only checking in! The rooms are grand, opulent and traditional. 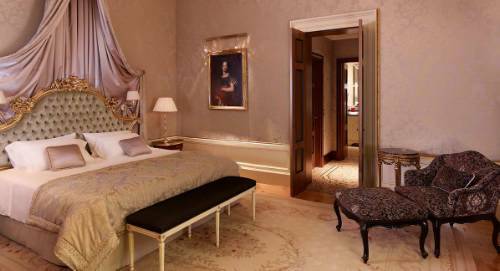 The Doge Dandolo Royal Suite is generally considered to be one of the best hotel suites in the world and a keen favourite with honeymooners. To enjoy a glass of champagne in the award winning Bar Dandolo or an exquisite afternoon tea is a must for all visitors. The Ca'Dei Conti is perhaps Venice's best kept secret, located in a quiet spot over looking one of the canals, this hotel is magical. Accessed by a private bridge the hotel is very much in keeping with the grand private residence that it once was. The rooms are elegant and decorated in vibrant jewel colours, my blue and gold suite was unmistakably Venetian. The hotel staff are exceptionally helpful and able to offer advice on pretty much anything from restaurant choices to where to book tickets for various events and concerts. The perfect place to start and end your evening is at the hotel bar or in the summer months on the sun deck - Ca'Dei Conti is somewhere to relax and feel immediately at home. The "Harry's Bar" brand is famous worldwide but this is your chance to visit the original Harry's Bar and arguably the best. This is where it all started and where the first Bellini was mixed by Giuseppe Cipriani , the founder of this iconic establishment in 1948. The food is simple Italian fayre but delicious, the house risotto is made to a top secret age old family recipe and is the obvious choice to accompany your Bellini. Harry's Bar is just as much fun to visit in an afternoon for coffee and cake as it is for dinner. Seafood lovers should head to Riviera to experience one of Venice's fine dining establishments. It's important to book as although there is a large outside terrace overlooking the water, in the colder months indoor seating is limited. The food is exceptional, beautifully presented and accompanied by a world class wine list, traditionally Italian so fortunately once you are seated you can stay and enjoy for as long as you would like to! For a real treat, take a water taxi across to The Cipriani Hotel and enjoy dinner at the Fortuny Resturant. 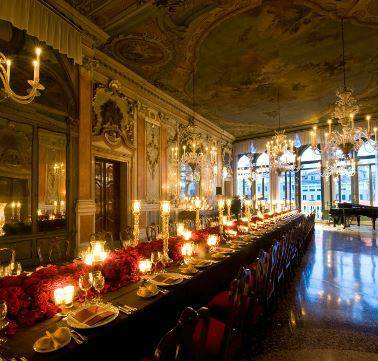 This has to be one of the most most exclusive venues in all of Italy and the food doesn't disappoint. Be prepared for a large bill at the end of dinner but a wonderful experience. The Spider crab, Venetian style comes highly recommended, but all dishes looked like appetising works of perfection and change with the seasons. Don't forget to enjoy some traditional Gelato in Venice, there are many Gelaterias throughout the city if you would prefer to take a break to indulgence in this most calorific but wonderful sweet Italian treat. In Venice there is so much to see, a tour along the Grand Canal is a must, although I'd advise going in a Vaporetto or water taxi rather than a pricey gondola. If a gondola ride is an essential part of your trip (and let's be honest, to most first time visitors it is) I'd advise finding one away from the key tourist spots on one of the quitter canals- you can hail them like a taxi. 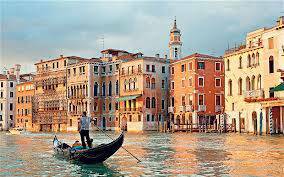 The concierge at my hotel were very helpful in arranging this and it also meant that we were able to see some of real Venice in peace and tranquility as well as the main sights on The Grand Canal and Lagoon. The Rialto Bridge and Bridge of Sighs are two obvious photo opportunities best enjoyed from the water rather than fighting your way past tourists, street vendors and stumbling over a proposer on bended knee. St Mark's Square, Doge's Palace and Basilica need to be ticked off of the list and classical music concerts are a frequent treat in the square. One word of advice, if you stop for a coffee in St Mark's Square the cafes with the best vantage points are the most expensive and they are all tend to charge top Euro. A short water taxi ride away is the Santa Maria Basilica, one of the wonders of Venice. This domed Basilica is a famous part of the Venice skyline often depicted by artists, however once inside the interior decor will take your breath away, and probably leave you with a sore neck from studying the intricate ceiling. A short walk away is The Peggy Guggenheim collection, a lovely place to spend the afternoon even if you have little interest in modern art. This once private collection includes priceless masterpieces and perfect examples of cubism, surrealism and abstract art. The Venice Academy Gallery will appeal to those who appreciate more classical art, original paintings from the most famous Venetian artist, Canaletto can be viewed here. Murano glass is synonymous with Venice and increasingly popular. A trip across to the Island and tour of the glass factory is both interesting and a great place to pick up colourful souvenirs. Getting to Venice is half the adventure, especially if you arrive at night. A water taxi is expensive but is a lot of fun, especially at night time where transfer time from Marco Polo airport to St Marks Square takes around half an hour. The most fabulous way to arrive in Venice, is of course abroad The Orient Express however Easy Jet can get you there for at fraction of the price at about £100 per person. There are flights daily from London Gatwick and Stanstead airports.